Take control over SpringBoard! Dreamboard lets you place anything from widgets to apps where ever you want. Theming is no longer limited to just icons, or having to resort to complicated setup themes involving Iconoclasm, SpringJumps, etc. Compatible with iPad although not all themes compatible. Not all themes recommended with older generation devices. Sounds pretty awesome, right? Well, it would be, if it wasn’t complete and utter rubbish. In reality, this app does nothing expect show you images of other operating systems. It is not an “advanced theming platform” and neither does it apply themes to your device. This is a prime example of an App Store con. Despite its exciting description, the app lives up to none of its claims, and instead fleeces you for $3 for a selection pictures. The thing is, the app doesn’t actually breaking any of Apple’s rules, and developers have the option to modify App Store descriptions after their title has been approved. So it’s likely that this useless knockoff was submitted with an entirely different description and Apple saw no issues. Since then, that description has been changed to fool customers into parting with their cash. 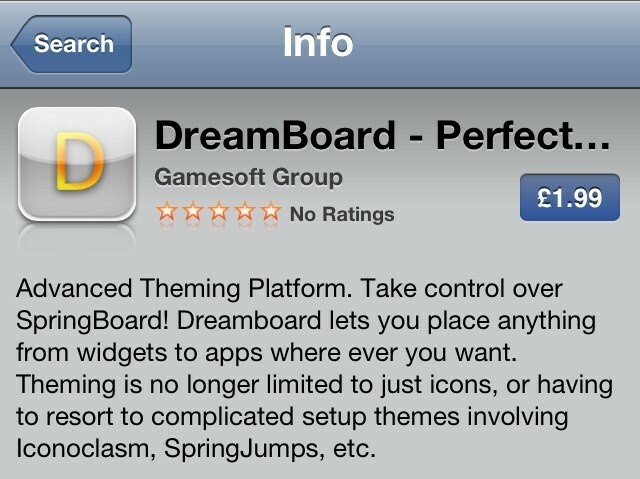 What’s worse is that the developer is registered as “Gamesoft.” Could this be to fool people into thinking DreamBoard is from the reputable software company Gameloft? Probably. Do us a favor, don’t throw this developer your $3, no matter how curious you are.